Presley Lee Jones, 87, of Altamont, died at 2:11 a.m. at Lutheran Care Center, Altamont. 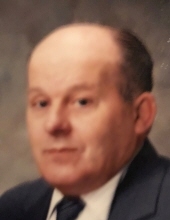 Funeral services will be at 11:00 a.m., Thursday, April 11, 2019 at Gieseking Funeral Home, Altamont with Rev. LeRoy Tucker officiating. Burial will follow at Union Cemetery, Altamont. Visitation will be from 5:00-7:00 p.m., Wednesday, April 10th and for one hour prior to service time at Gieseking Funeral Home, Altamont. Memorials may be made to Meals-on-Wheels, Altamont location or to Lutheran Care Center, Altamont. Presley was born on Saturday, August 22, 1931 in Mound Township, rural Altamont, Effingham County, Illinois to Elmer and Laura (Conner) Jones. He married Shirley Robison on August 22, 1949 and they enjoyed over 40 years of marriage before her death on January 10, 1991. He was retired from Central Management Services, Effingham and had also worked with Coslet Motor Company and had owned and operated Jones Garage, both in Altamont. He is survived by: sons, Milan Robison, Effingham, Jeffrey Jones and his wife Karla, Effingham, and Jerry Jones and his wife Mona, Altamont; daughters, Sherry Snively and her husband Charles, East Alton, Sally Reed, Altamont, Stacy Stuckey, Altamont; sisters, Doris Doedtman, Toledo and Pat Jones, Effingham; 14 Grandchildren and several great grandchildren. Presley was preceded in death by his parents, wife, daughter, Susan Pagel, brother, Calvin Jones, and sister, Bonnie Brackney. To send flowers or a remembrance gift to the family of Presley L. Jones, please visit our Tribute Store. "Email Address" would like to share the life celebration of Presley L. Jones. Click on the "link" to go to share a favorite memory or leave a condolence message for the family.